New camera! A fancy Canon real camera! Thank you hugely to my brother-in-law who shipped it across the country and my husband who presented it to me on my birthday! I am SO excited! I wanted something beautiful to photograph for my first use of the fancy camera and a pumpkin cheesecake would have to do. Alas, it has been raining for the entire duration of this weekend. Entire. Well, for the entire duration of the lifespan of this cheesecake so the lighting wasn’t optimal but boy was it better than it has EVER been with a real camera! I can’t wait to play with this some more and get better at photographing with it! Oh, I guess I should tell you about the cheesecake. Let’s see. 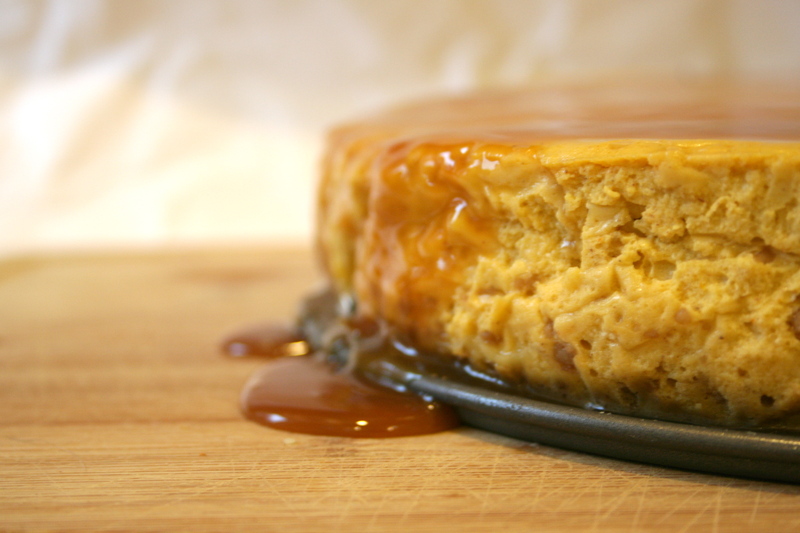 Gingersnap crust, perfectly dense pumpkin filling, caramel slathered all over the top. Preheat oven to 325 F. Line the bottom of your springform pain with aluminum foil twice, allowing for the edges to come above the side. Your cheesecake will sit in a water bath soon and you won’t want water seeping in! Food process all of your ingredients together and press your moistened crumbs into the bottom of a 9″ springform pan. Bake for 15 minutes and remove to cool. In the mean time, make your filling! In a medium saucepan over medium heat, heat your pumpkin, sugar, spices and salt until the sugar is melted and the mixture takes on a dark brown nutty hue (about 5 minutes of a soft simmer). While you’re at the stove top, start heating up your water for your water bath. Cheesecakes need water baths otherwise you’ll end up a cracked cheesecake surface. Let cool slightly by processing in a food processor. Add in your heavy cream and process until combined. Add your cream cheese about 1/3 of a package at a time until well incorporated. Finally, add in your eggs and pulse just until combined! If you don’t have a food processor, you can do all of this with just a hand mixer. Just make extra sure to incorporate the cream cheese well. It would probably help to sift the filling at the very end into the pan to ensure a silky-smooth finish. Either way, pour your filling onto the prepared gingersnap crust (doesn’t that just sound lovely?). Place your entire springform pan into a large roasting pan and pour the hot water into the roasting pan until your springform pain is about halfway immersed in water. Bake the entire thing (roasting pan and all) for 1-1/2 hours until there is no jiggling! Let cool in the water bath for about 45 minutes before removing the pan. Refrigerate for 4 hours or overnight and then remove the springform pan, loosening the sides with a knife. Top with homemade caramel sauce…oorrrr…with pre-made ice cream sundae caramel sauce topping (I did the later…oops…). Want it salted? 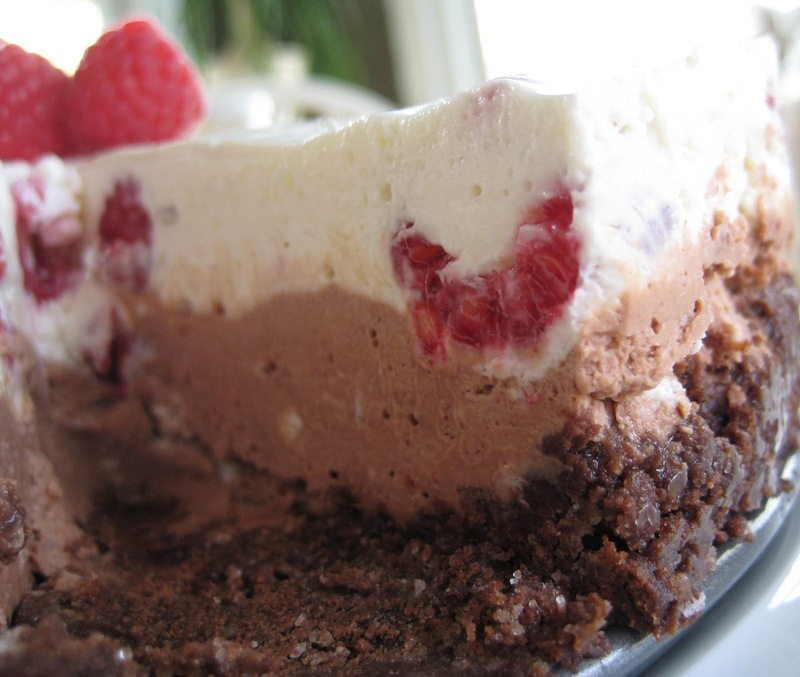 Fleur de sel on top will do it for you! Time to bring out the fall candles, buy some pumpkin puree, and make some pumpkin theme things! 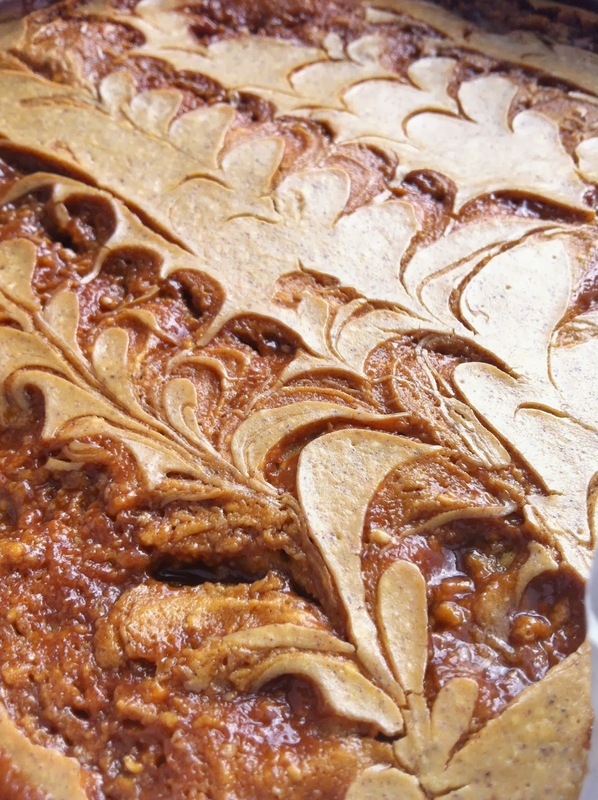 What better way to do that than with this amazing fall-in-a-pan dessert? The original recipe was too sweet with not enough cheesecake for me so I cut some sugar out and doubled (bam!) the cheesecake component. 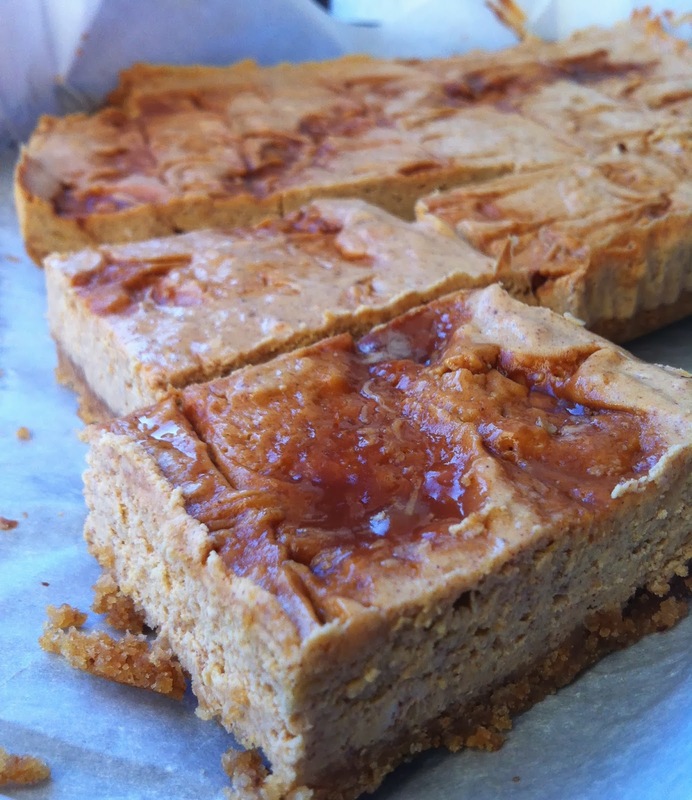 Making for some absolutely amazing cheesecake bars. 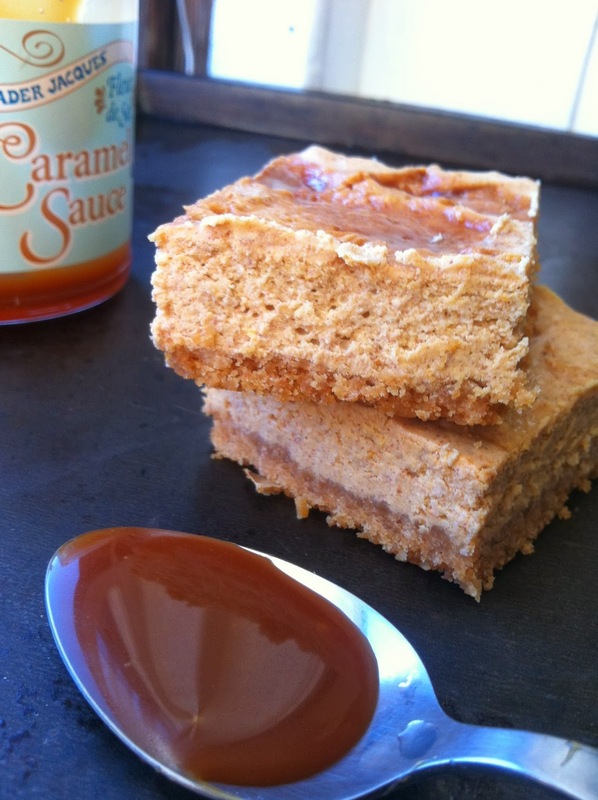 The star of these bars is the Trader Joe’s Fleur de Sel Caramel Sauce (pictured in background). This stuff is SO good and thick (required for this recipe) with the perfect hint of saltiness. Bring on the pumpkin themed baked goods! Fall is here! 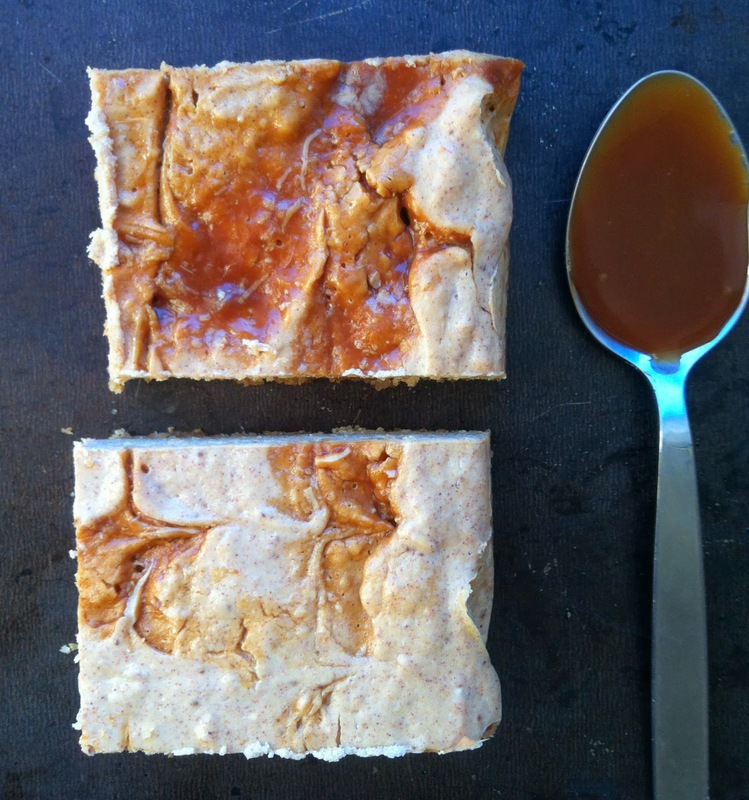 1/3 cup salted caramel sauce – recommend Trader Joe’s Fleur de Sel sauce! Preheat your oven to 350 degrees. Line a 8×8 pan with parchment paper, leaving enough overhang so that you can pull the bars out later without disturbing their shape. Combine the ingredients for your crust and press into the bottom of the pan. Bake for 10 minutes. Cream together your cream cheese and sugar until well incorporated. Slowly add in your vanilla, pumpkin, and spices. Add in your eggs one at a time. Finally, add in the flour until well incorporated. Pour this fall mixture on top of your crust! 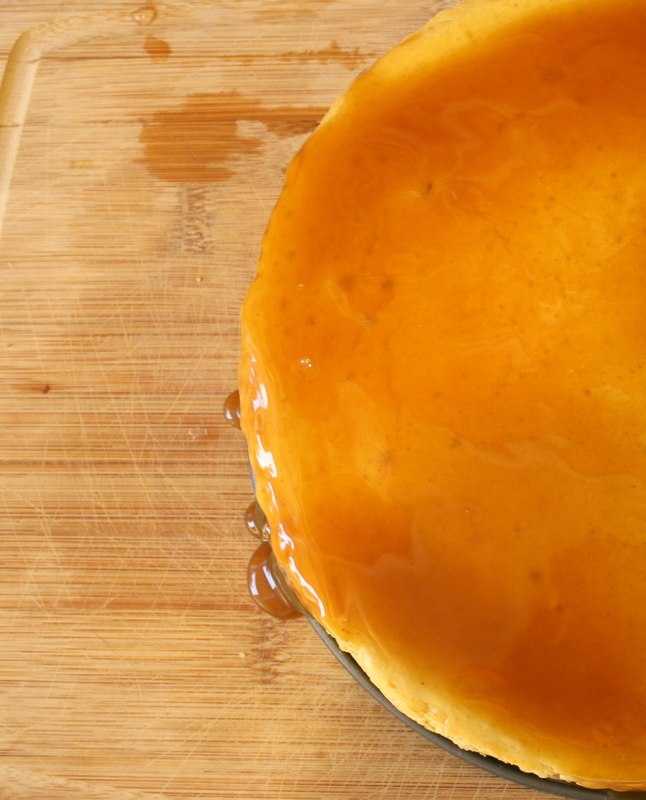 Using your favorite thick caramel sauce, make 4-5 vertical lines of caramel sauce. Then, going 90 degrees to your lines, take a toothpick and gently drag your toothpick through the sauce and pumpkin cream cheese. Like in elementary school making marble paper! Flip your pan another 90 degrees and repeat until desired marbling is achieved. Now, if you’d like to avoid cracks on the top of your beautiful pattern, boil about 6-7 cups of water in a tea-kettle. Place your pan of cheesecake inside a larger pan. Place this set up in the oven and pour your hot water into the larger pan, creating a water bath. You want the water to come about half way up your cheesecake pan. You can bake it without the water bath, but then cracks will happen. Bake for 45-50 minutes or until the middle stops jiggling (very scientific, I know). Let cool for at least a few hours (overnight is best) before cutting into these and serving. They’re delicious and beautiful! And no oven involved? Yup. Hope you guys are okay with the occasional Instagram filter … I am! This cheesecake is so pretty, I squealed. 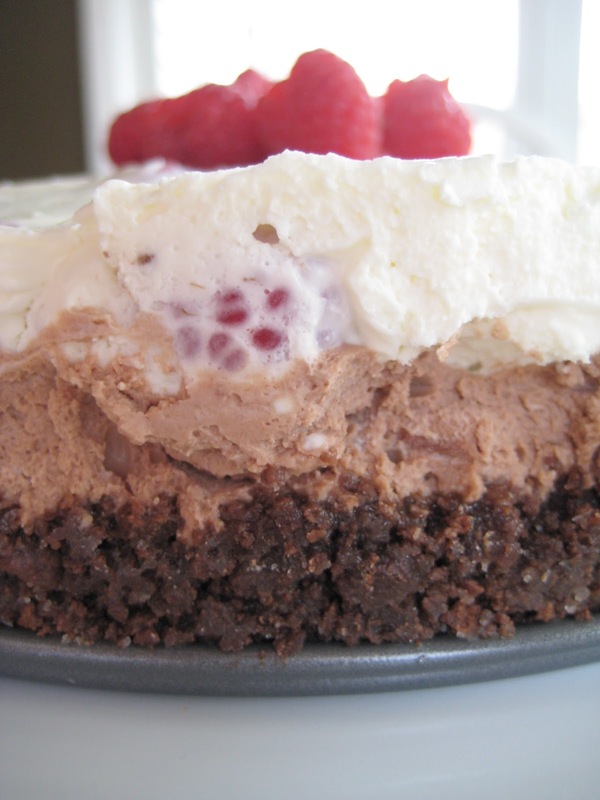 The top layer is speckled with the profile of fresh raspberries, the middle layer is whipped chocolate deliciousness, and the bottom is …well, it’s chocolate graham cracker crust – how do you think it is? Really though, I was squealing for a while. Combine ingredients and press into the bottom and up the sides a bit of a 9″ springform pan. You can also conceivably do this in a normal rectangular pan, but you won’t be able to lift the sides off. Just don’t let the pan stop you from tasting this! 19 ounces of cream cheese, softened. Melt your chocolate first – taking 30 second spins in the microwave until fully melted, stirring after each 30 seconds. Set aside and let cool. Sprinkle your gelatin over the cold water into a small sauce pan. Let this stand for a minute and then heat over low heat. Stir every minute or two or until the gelatin has dissolved and it looks like a crystal clear mixture in the pan. This should take about 5 minutes. No need to let it boil, just let the heat melt the gelatin. Leave in the pan and turn off the heat. Bowl 1: beat your whipping cream until you get nice stiff peaks. Hand mixer highly recommended. Bowl 2: beat cream cheese and sugar. Slowly add in gelatin which at this point should be slightly cooled, but not hardened. Your mixture may look clumpy and gross – hand mixer to the rescue! Mix mix mix and it’ll become incorporated into one homogenous mixture. Adding the gelatin mixture in slowly also helps. Bowl 3: Add in half of bowl #1, half of bowl #2, and fold in your melted chocolate. Fold so you don’t lose all that lovely air you put into your whipped cream! Yes, this is the chocolate layer. Once well incorporated, pour over your crust. Bowl 4: Add in the other half of bowl #1, the other half of bowl #2, and fold in the raspberries. Begin squealing. Pour this layer over your chocolate layer and carefully spread out the top with whatever you please. If you have an angled spatula, I have to recommend it. Worked like magic. No more bowls! Cover and refrigerate for 6 hours or overnight. When you’re ready to remove the sides of your pan, run a knife along the edge and the lift away. 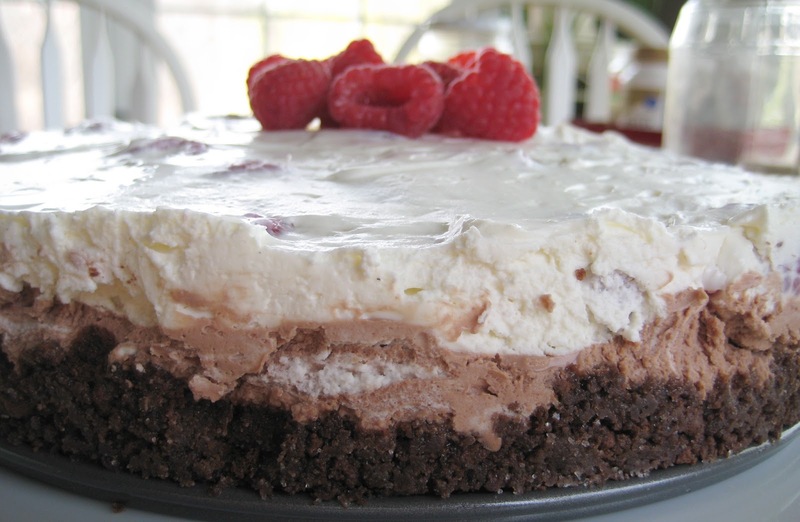 I garnished the top with some more raspberries – totally optional. Dig in! I also froze a huge slice for a special visitor, and snuck a bite. It’s awesome frozen. Over Christmas break I received a fabulous book courtesy of the in-laws. It’s the kind with ribbon page markers and a matte binding…you know, that kind you just want to feel. It’s the kind of cookbook that is part fascinating read, part actual cookbook. 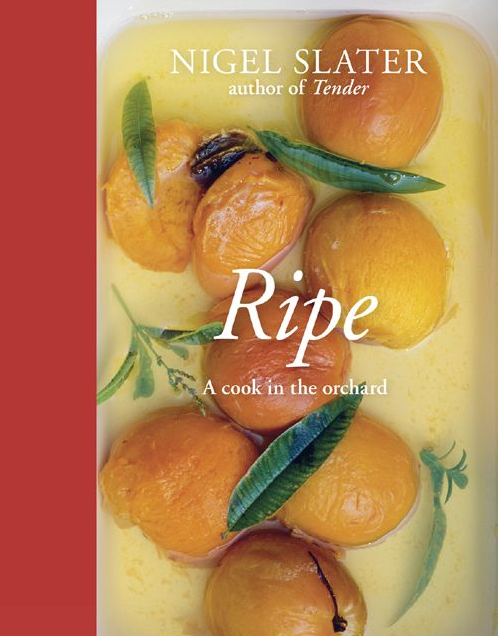 Nigel Slater takes all kinds of fruits and makes the most amazing concoctions out of them. Unlike most fruit based recipes, these recipes don’t drown and cover the fruit in sugar but instead highlight them as the star of the show and put the baked goods part in the background. 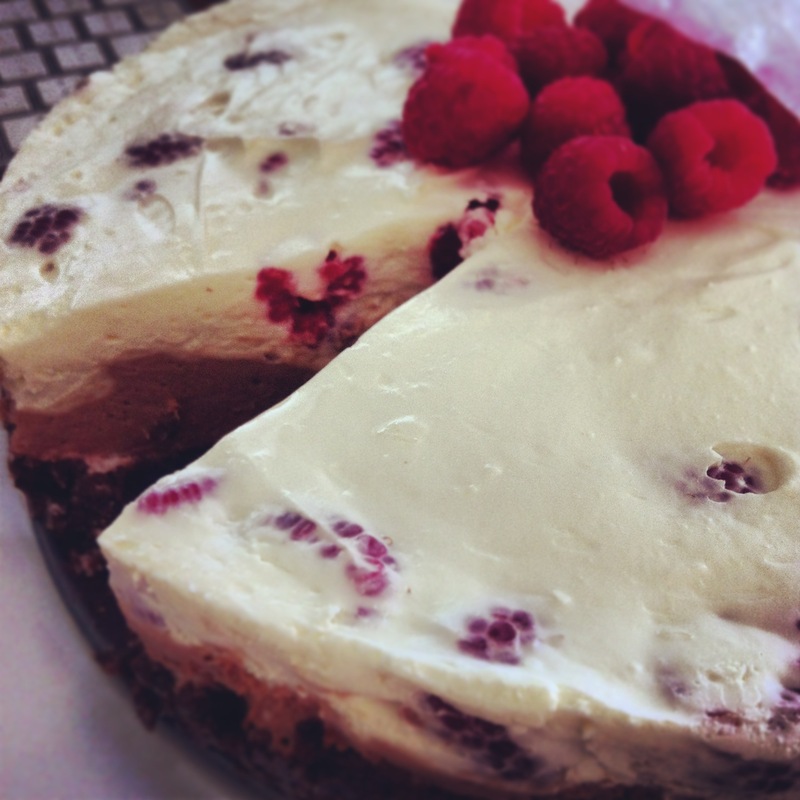 Case in point: this cheesecake. Now normally when you see fruit in a cheesecake, it’s some sort of fruit turned into syrup swirled into cake. This version however has the cherries sitting on top in their natural glory. 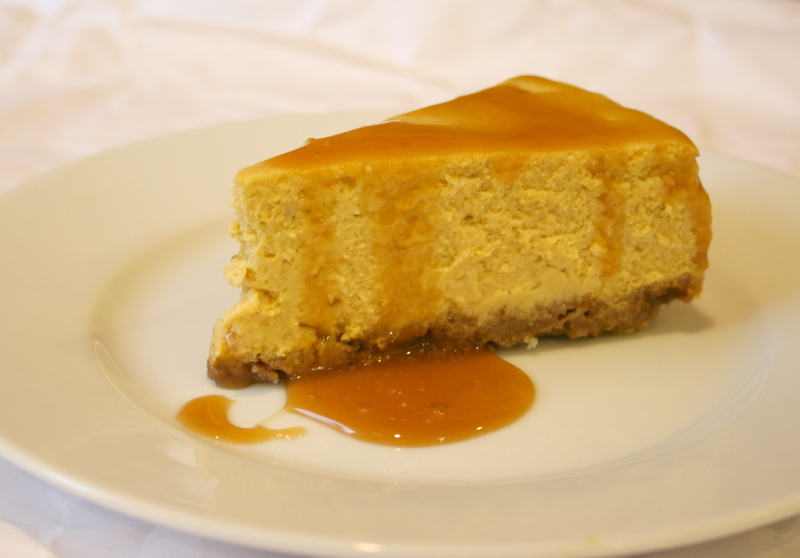 The cheesecake itself is much, much lighter than it’s traditional cousin without that dense sweetness that we usually associated with cheesecake. Cherries take the show here! Light cheesecake and a shortbread crust (not graham) take the backstage blending together in a lovely, light and fruity baked good. Preheat the oven to 350F and lightly butter an 8 inch square pan (For easy removal, line with parchment paper). In a food processor, crush the shortbread cookies into crumbs. Combine the crumbs with your melted butter and mix. Pat this deeelicciouss smelling mixture into your pan and refrigerate for half an hour. In the meantime, combine ricotta, cream cheese or mascarpone, cream, and sugar. Add the zest and juice of all of your lemons, vanilla, eggs, egg yolk, and cornstarch. Pour this mixture on top of your now cooled shortbread crust and bake for 50 – 60 minutes or until firm to touch (or it passes the toothpick test). Cover the pan with tin foil it the top begins to brown. Turn the heat off of your oven and let your cake finish cooling in the oven. Let your cheesecake chill in the fridge overnight. Prior to serving, scatter your cherries on top! That’s it! Optional: Make a simple syrup of 1/2 cup water to 1/2 cup sugar by heating the two over medium heat until the sugar is disolved. 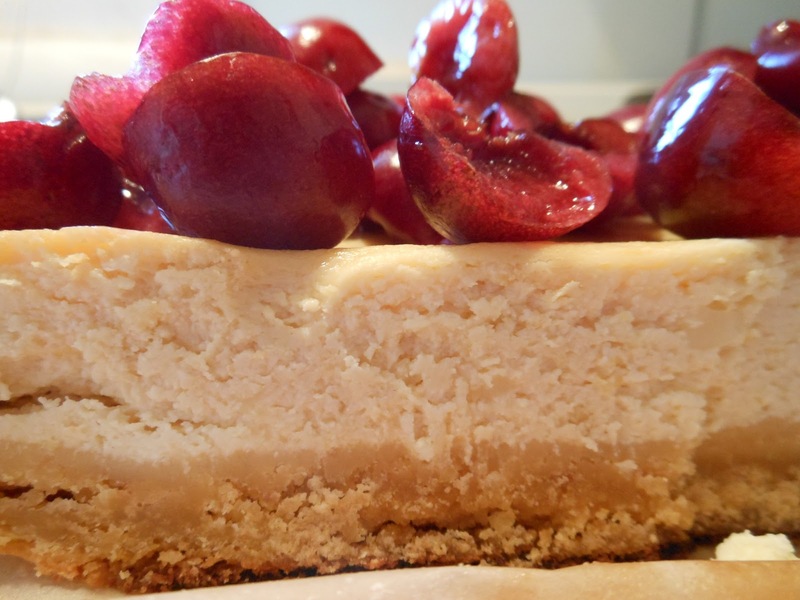 Give your cherries a quick swim in the syrup until slightly warmed and pour over cheesecake. It’s so pretty!!! This is a continued take on last weeks holiday bars – I just love the way cranberry and white chocolate taste (and look!) together! 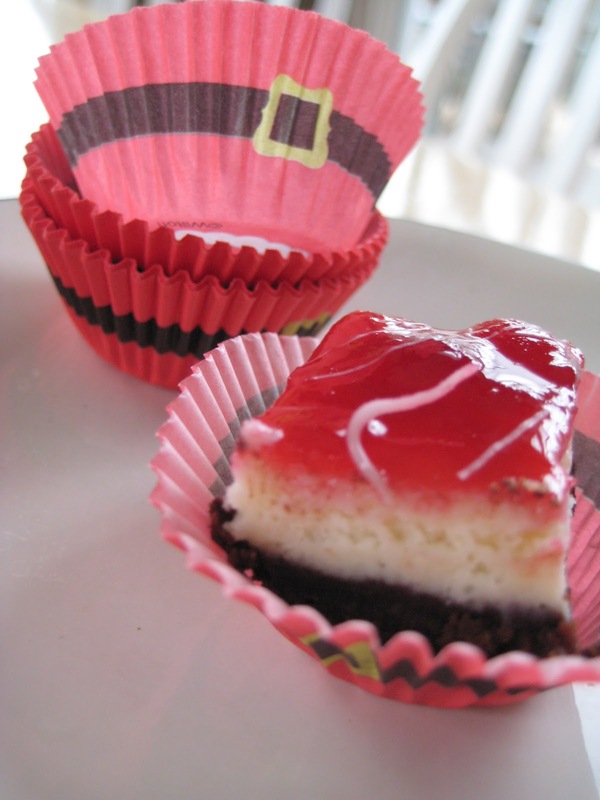 There is white chocolate not only drizzled on top of these cuties, but also incorporated into the cheesecake filling. Also, I don’t know about you guys, but I love when things are in miniature form. So this is the perfect dessert to serve buffet style, cocktail style, or just any way because you make it as a large sheet of cheesecake and cut it into little squares for sharing! Although these may be harder to ship and share, they certainly will be welcome at any holiday event. To make things even cuter, I stuck them in some santa mini cupcake liners. Pretty cute right? Beautiful, delicious, and most importantly of all – holiday baked goods! Is it thanksgiving yet? Combine these ingredients in a saucepan over medium high heat until cranberries start to pop and break down. Pour through a mesh sieve to filter out the little cranberry skins and leave you with cranberry jelly! 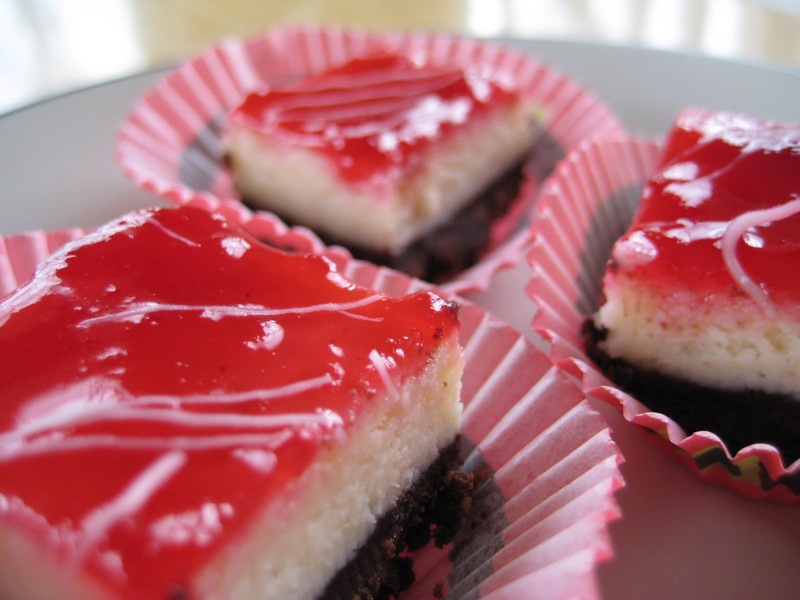 Pour your jelly into a container and put it into the fridge until your cheesecake is ready. 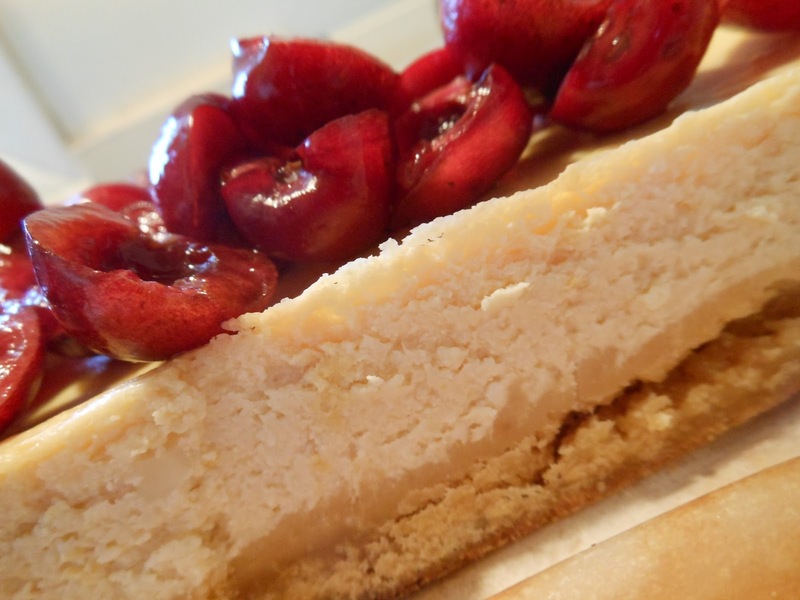 Cheesecake crust: I doubled the original recipe because I love crust. You can always half the recipe back to less crust. Prepare your cheesecake pan! Double line a 9×13 baking pan (or 8X8 if you want more cheesecake:crust ratio) with 2 layers of foil, taking care to leave extra foil hanging from the edges so that you can simply lift the entire cheesecake out later. Over low heat, melt together the chocolate chips, unsalted butter, and cocoa powder. Once combined, remove from heat and stir in graham cracker crumbs and flatten this mixture onto the bottom of your prepared pan. Stick it into the freezer while you prep your cream cheese filling. Whip up your cream cheese until it’s nice and fluffy without lumps. Incorporate your eggs, sugar, and vanilla. Slowly add in your melted white chocolate chips. 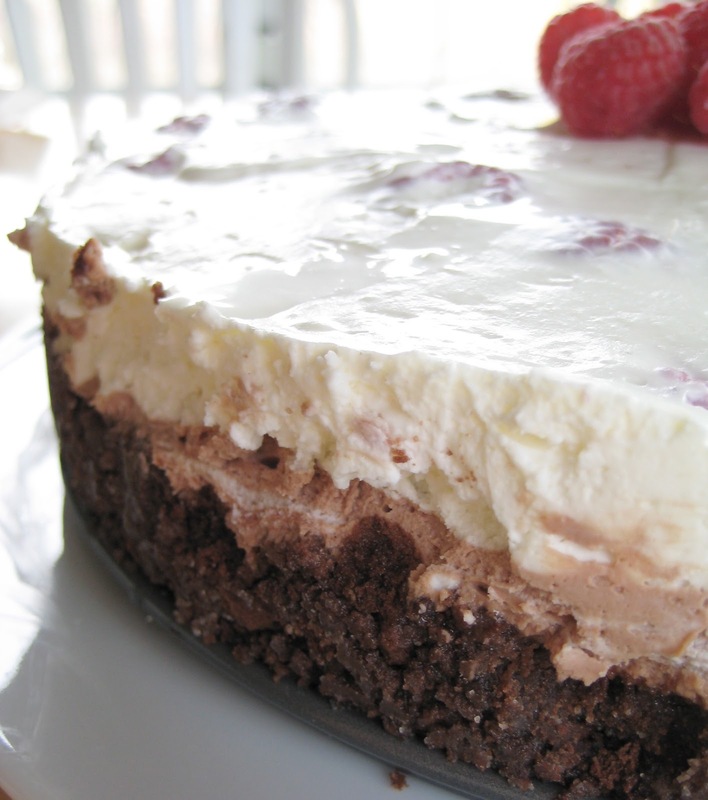 Once it looks delicious, plop your cheesecake filling on top of the chocolate graham cracker crust and bake for 40-45 minutes and let cool in the fridge for at least 4 hours to overnight. 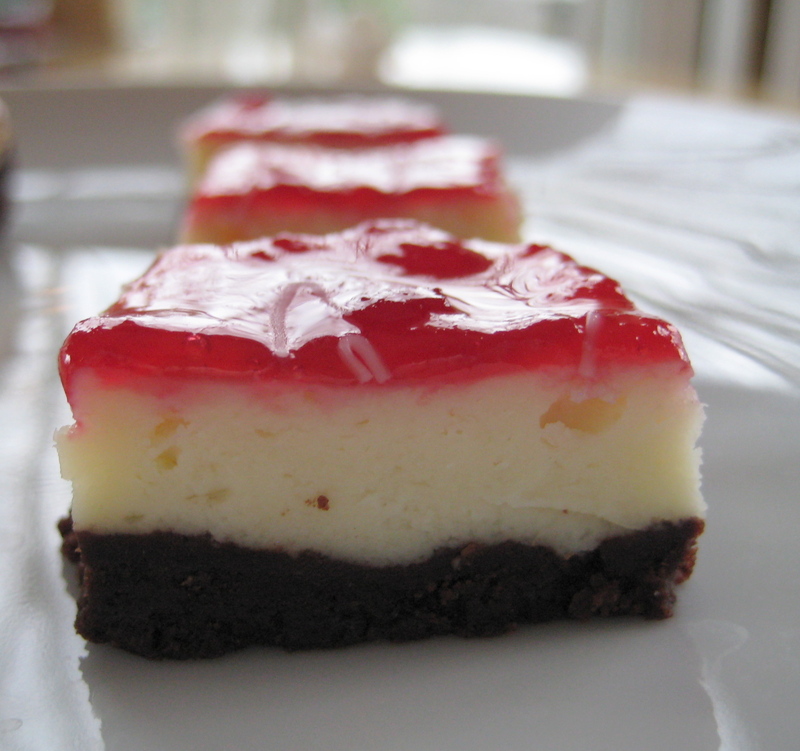 Once your gorgeous cheesecake on top of chocolately crust has cooled, take about half of your cranberry jelly and melt in the microwave for 30 seconds. Stir your jelly until clump free and if you’re feeling super meticulous, you can re-seive it. Spread this on top of your cream cheese filling and if you want, you can melt just a little more white chocolate and use the ziploc bag technique to swirl some white chocolate on top of the red jelly.